For several years now, the South has been a top destination for those moving across state and national borders. With many states that both attract newcomers and retain people born in the state (states considered to be both "magnet" and "sticky"), the South has been the fastest-growing region in the U.S., at the expense of the Northeast and the Midwest. Political observers project that the region's population gains, which included an increase of 1.1 million people from 2012 to 2013, will further strengthen the South's political clout as it gains congressional seats and Electoral College votes after the 2020 Census. According to a New York Times analysis of migration in the U.S.*, transplants may also be changing the political leanings of the South -- a trend that may affect four major Senate races currently playing out in Arkansas, Georgia, Louisiana, and North Carolina. The Time's data tracks migration flows in and out of states over the past century, looking particularly at movement across state lines. In a follow-up analysis of the data, The Upshot writer Nate Cohn finds that while several Southern states are seeing dramatic increases in their out-of-state-born populations, differences in migration patterns may affect individual states' political leanings. Cohn observes that states like Florida and Virginia that have a sizable portion of Northeast and West Coast transplants are increasingly trending purple and even blue. North Carolina, where Democrat Kay Hagan is defending her seat against Republican Thom Tillis, is another state that has seen a significant uptick in out-of-staters in recent decades. The native-born population in the state has declined by 12 percentage points since 1990 to 58 percent of the state's population. 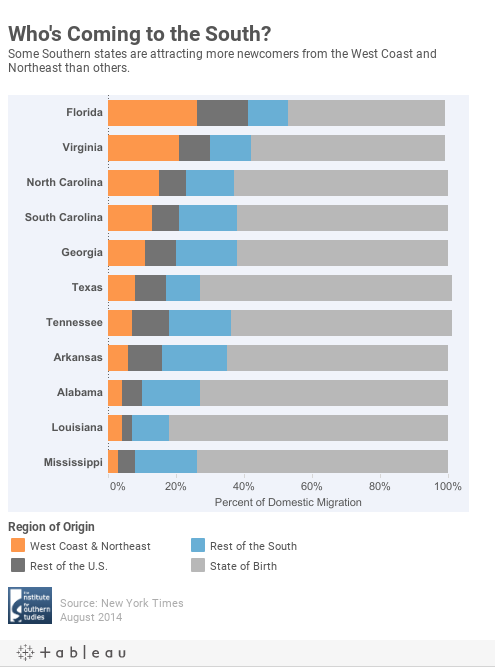 As in Florida and Virginia, more U.S.-born transplants coming to North Carolina are from the Northeast and the West Coast than from other Southern states, although by a much narrower margin than in the other two states (see chart). Meanwhile in Georgia, where Republican David Perdue is squaring off against Democrat Michelle Nunn, there has been a similar pattern of people flowing into the state. Like North Carolina's, Georgia's native-born population has dropped since 1990 from 64 percent to 55 percent, and both states have seen an uptick in the foreign-born population over that same period. Although North Carolina and Georgia both have a sizable portion of Northeastern transplants, particularly from New York, Georgia has a larger proportion of newcomers from other Southern states than from the Northeast and West Coast. Different migration trends dominate in the other two Southern states with hot Senate races this fall — Arkansas, where Democrat Mark Pryor is in a dead heat with Republican Tom Cotton, and Louisiana, where Democrat Mary Landrieu is defending her seat against two Republican challengers in an open primary. (A run-off between the top two vote-getters will be held on Dec. 6 if no candidate gets 50 percent of the vote in November.) Unlike in Georgia and North Carolina, the percentages of native-born residents in Arkansas and Louisiana have been relatively stable over the past century, and transplants have largely come from other Southern states. In Arkansas, about 60 percent of the population has been native-born since 1900 with a slight uptick in the 1950s and '60s but declining again in recent years. Most transplants come from neighboring states in the South and Midwest: Tennessee and Mississippi towards the beginning of the century, and Texas and Missouri in recent years. Apart from a significant number of transplants from California, few Arkansans are natives of northeastern or West Coast states. Louisiana has had a traditionally high rate of Southern-born and native-born residents. In 2012, 79 percent of the state's population were Louisiana natives — a number that has not changed much over the past century and has not changed at all since 1990. On the flip side, the portion of native Louisianans leaving the state has been slowly but steadily increasing. Many relocated to other parts of the state and the country in the aftermath of Hurricane Katrina in 2005, although many also returned. Overall, the Times migration project reports that more people left the state than came back. At the moment, North Carolina is the state where the Democratic Senate candidate is polling strongest. Although many factors — like money and voter enthusiasm — will come into play, it may be telling that North Carolina is also the only state among the Southern four where more U.S.-born newcomers there were from the Northeast and West Coast than were from other Southern states. As demographic changes continue in the South, it will be interesting to watch how these migration trends mingle with other demographic changes like immigration to shape the region's political future. * Unless otherwise noted, all statistics mentioned in this article are from the New York Times' "Where We came From and Where We Went, State by State" report.